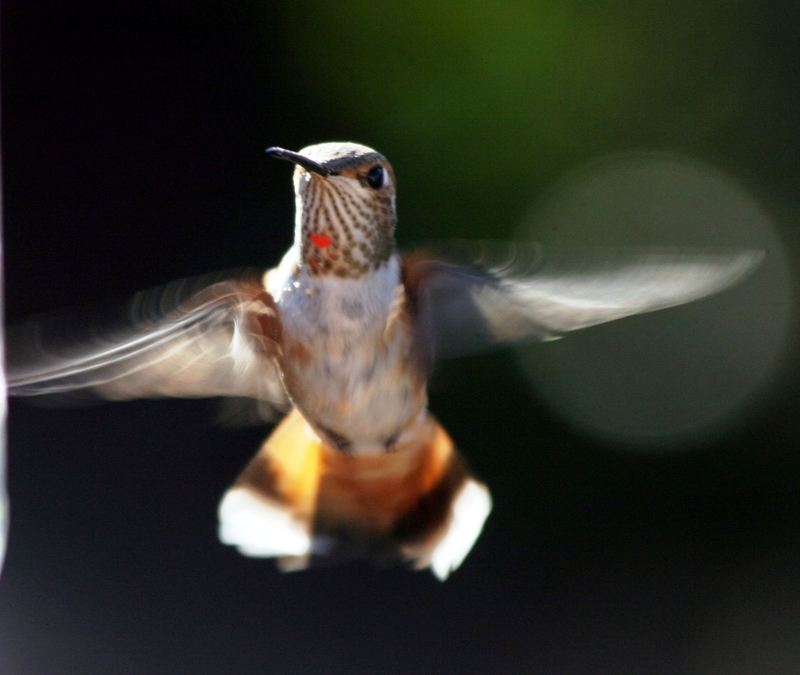 The eastern half of the U.S. rarely sees but a single hummingbird, the Ruby-throated. This Mexican resident comes north to nest, braving the Gulf of Mexico during both its spring arrival and fall return. 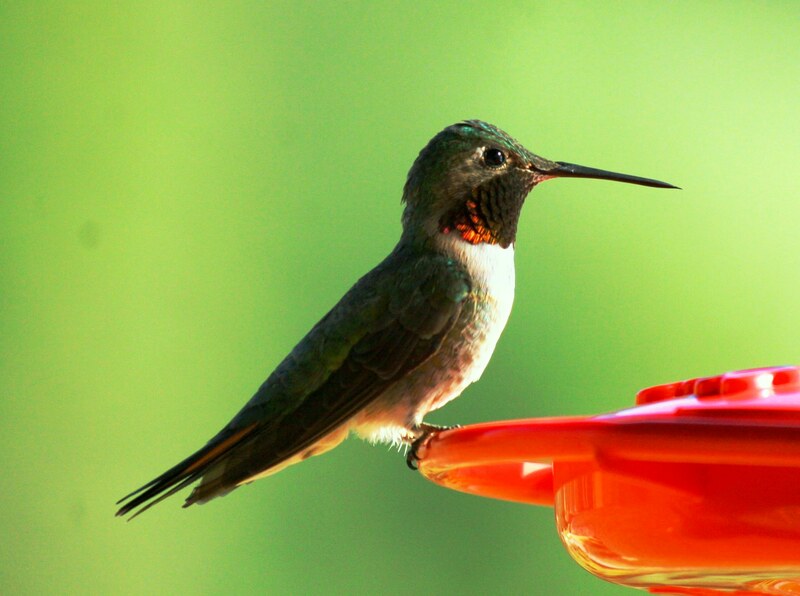 Similarly, Summit County is home to just one nesting hummer, the Broad-tailed Hummingbird. 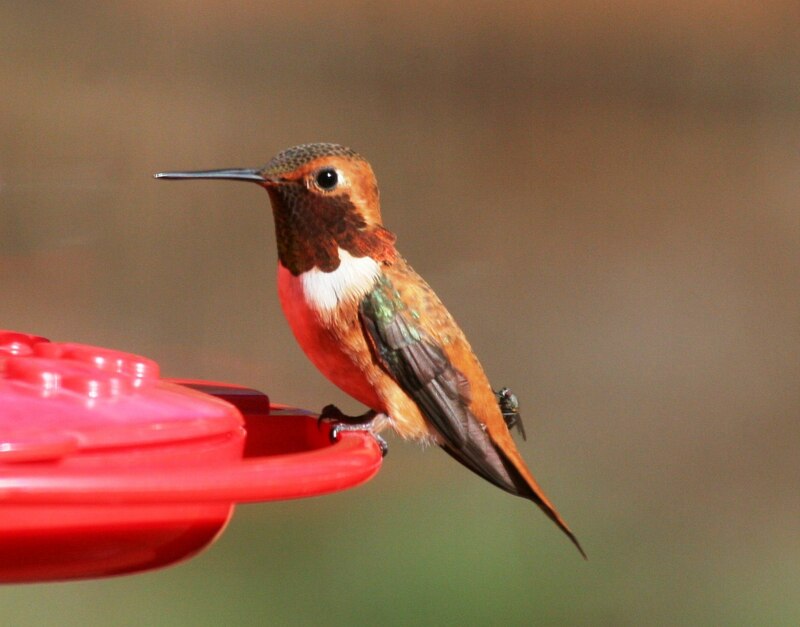 Unlike eastern states, however, Summit County also enjoys two other migrating hummingbirds. Why are Hummingbirds so Fascinating? Hummingbirds are so unique that even those with no interest in bird watching are drawn to them. Not only are they the smallest birds in the world, their long bills, iridescent colors and high-speed acrobatics are unlike any other. Weighing little more than a penny, hummers move their wings in a figure-eight pattern that allows them to hover, fly sideways, vertically and even upside down. Wing beats up to 90 per second create the humming associated with their name, and their heart rate soars over 1,200 beats per minute at flight speeds of 60 mph. Talk about leaping buildings in a single bound, this is truly ‘Superbird’. 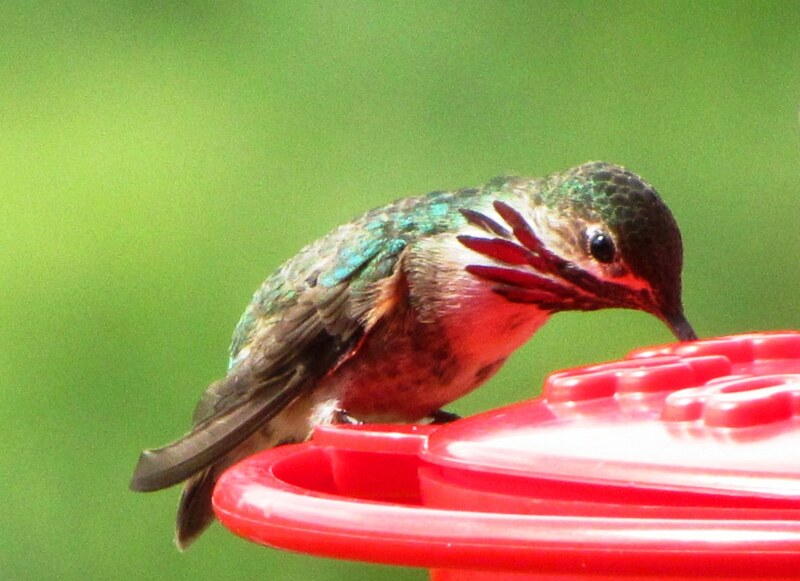 And, lucky for us, hummingbirds are found only in the Western Hemisphere. In addition to the Broad-tailed Hummingbird, two other species pass through our high country in summer, typically beginning in July. The more common one, and a direct relative of the Broad-tailed, is the Rufous Hummingbird, a pugnacious lightweight. The second summer migrant is the seldom-seen Calliope Hummingbird, the smallest bird north of Mexico. Calliope seems a strange name for a tiny, quiet bird, since the musical instrument of the same name is a big noisy machine. This beautiful little bird, however, was named for the Greek muse of epic poetry. And poetic it is, an unassuming and elusive gem. The Calliope is listed in Colorado as rare to uncommon, and during some summers it may be unseen. This year, though, hummingbird numbers appear high and already a few Calliopes have been documented. As is the case with most hummingbirds, adult males are the more distinctive, and the male Calliope is easily differentiated from our two other hummingbirds by its brilliant, streaked magenta gorget. Females are less obvious, but perched on a feeder their tails are shorter than their wings, contrasting with both Rufous and Broad-tailed. Calliopes nest in the high country of the Pacific Northwest, and visit Summit County to fuel their return to Mexico. Almost as small as the Calliope, the Rufous bears little other resemblance. This is the schoolyard bully of hummingbirds, and its aggression belies its size. Rufous nest from Oregon to Alaska, and migrate through Colorado on their way south, wintering for the most part in west central Mexico. This is the champion of migrating hummers, with one recently banded bird found to have traveled 2,800 miles from Alaska to Florida. Look for copper-colored birds with an attitude. This high-elevation bird arrives in spring as glacier lilies flower, raises two fledglings and returns to Mexico with our two migrants. The male is distinctive with a green crown, rose red gorget and white collar, and the tails of both sexes are clearly longer than our other hummers. Males produce a loud unique ringing with their outer wing feathers, sounding like a vintage telephone. Like all hummingbirds, females build the nests, incubate the eggs and raise the young. Males hang out at nectar bars, form no lasting relationships and have nothing to do with families. Selfish and irresponsible, but they do have a good time. Set out hummingbird feeders for a chance to see all three species, sometimes feeding together. Use easily-cleaned 16-ounce feeders with multiple feeding holes and perching rings. Avoid commercially-prepared food. They contain preservatives, and it’s cheaper and safer to make your own. Boil four cups of water, add one cup granulated sugar, bring back to a boil and let cool. Don’t add food coloring, it’s unnecessary and potentially harmful. Refrigerate unused sugar water, and clean feeders weekly. Hang feeders at least three feet from windows, and use more than one to level the playing field. Those Rufous schoolyard bullies can’t own every feeder. This entry was posted in Hummingbirds and tagged Broad-tailed Hummingbird, Calliope Hummingbird, Rufous Hummingbird, Summit County Colorado. Bookmark the permalink.